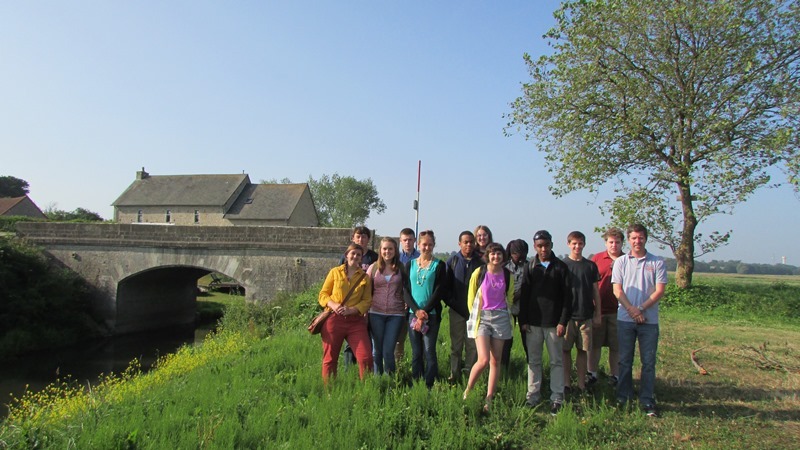 After over a week in New Orleans and Normandy, the Normandy Academy students are nearing the end of their trip. They have enjoyed perfect weather throughout with sunny skies and only one evening rain shower. Cool breezes have kept the beach visits pleasant and marked a major change from their time in New Orleans. 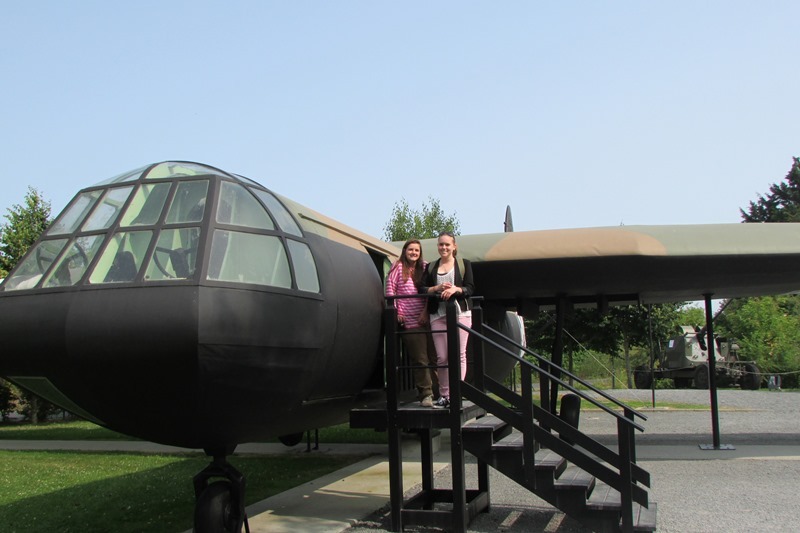 On Friday, June 26, the day began with a visit to Ste-Mere-Eglise, where the students heard the story of the paratoopers of the 82nd Airborne Division who liberated the town. Specifically, they learned of the heroism of Gretna, LA native John P. Ray who saved the lives of both John Steele and Ken Russel shortly after receiving a wound that would prove fatal. The students then applied their knowledge of the paratroop drop to future campaigns by discussing the lessons learned in Normandy. Debates and discussions continued throughout the site visits. 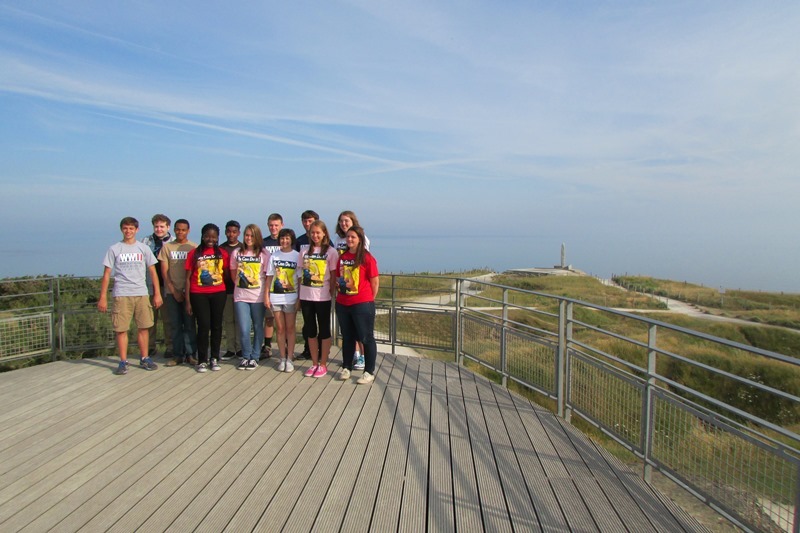 At Utah Beach, the students debated the addition of the beach through a risk/reward scenario. On Omaha, the students discussed the flight patterns of the bombing raids, and in the Falaise Gap, they debated several issues involving the French civilians who found themselves caught in the crossfire. A powerful experience came in the evening on June 28 as the students met French Resistance members Andre Heintz and Collette Marin-Catherine. The students heard the firsthand accounts of struggling against the German occupation against a general backdrop of hardship for all French civilians. 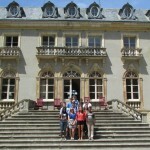 After the discussion, Heintz and Marin-Catherine joined the students for dinner at Café Mancel inside the Caen Castle. For more information on the Normandy Academy, call 504-528-1944, ext. 257 or email travel@nationalww2museum.org. 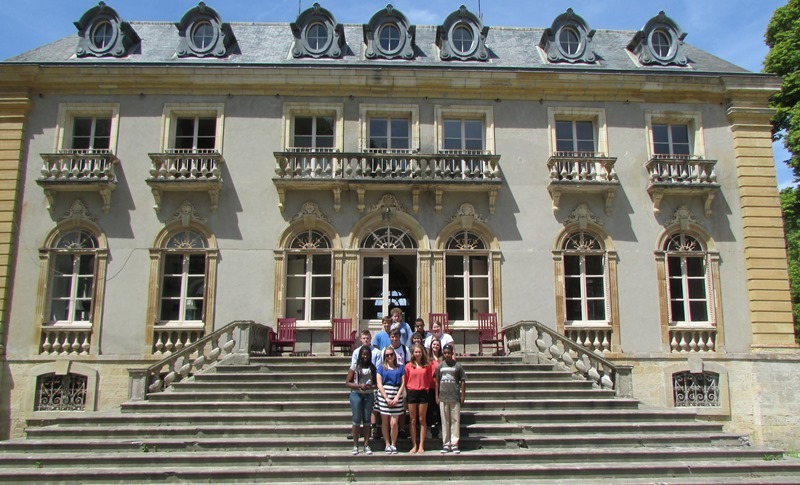 Normandy Academy students with Mr. Dan Ombredanne at Chateau Periers. 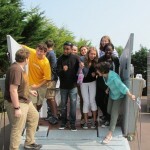 The Normandy Academy students arrived in France after three full days of touring at the Museum. Once in France, they stopped at the Eiffel Tower, the Arc de Triomphe, and Notre Dame. Now they were ready for their trip to Normandy. Arriving in the town of Bayeux, the students were immediately impressed by the Bayeux Cathedral, first completed in the 11th century with some portions completed later The cathedral now has an impressive blend of architectural styles. It was commissioned by William the Conqueror, and it is the original home of the Bayeux Tapestry. The students were in for a surprise when they found that their hotel was just two blocks from the cathedral. After their first French meal and a good night’s rest, they awoke reading and willing to visit the Normandy battle sites. 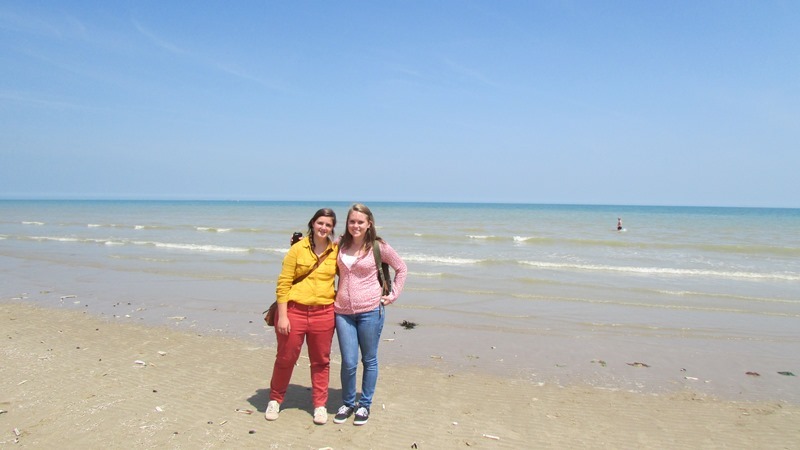 The first day of touring brought the students to the areas around Sword Beach. The first stop was at Chateau Periers, a private home just three miles from the coast. In this chateau, Marie-Louise Osmont kept a diary of her life from the German occupation of her home in August, 1940 until the last British soldier left her home in August, 1944. Her diary gives many insights into the life of both German soldiers and French civilians under occupation. 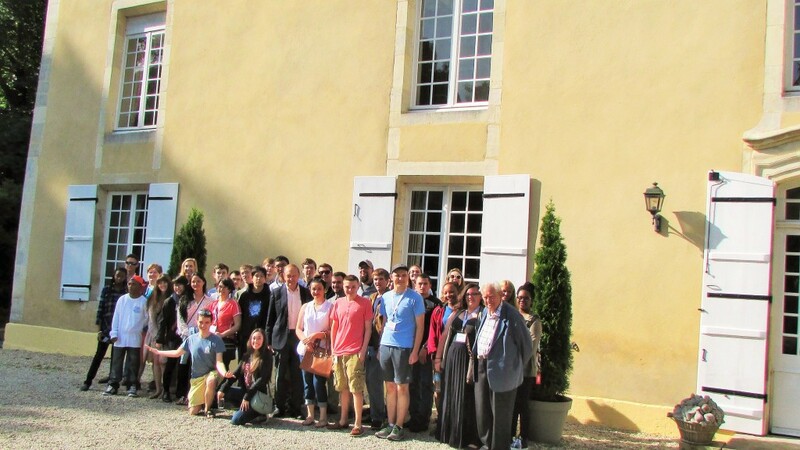 The current proprietor of the chateau, Mr. Dan Ombredanne welcomed the students to the chateau along with the town mayor to give a tour of the grounds and the interior. 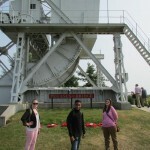 Later in the day, the students visited Pegasus Bridge, the Riva Bella Tower, and the German Battery at Longues sur Mer. 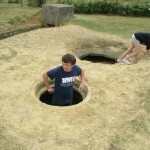 At each stop the students debated decisions made in the course of the battle. At Pegasus, the students debated whether the bridges along the Orne, Dives, and Merderet Rivers should be destroyed or preserved prior to the landings. 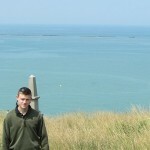 At Longues sur Mer, the students discussed the length of the naval barrage—How long? When should it cease? Still awaiting the students are visits to Utah Beach, Omaha Beach, Caen, and a conversation with a veteran of the French Resistance. 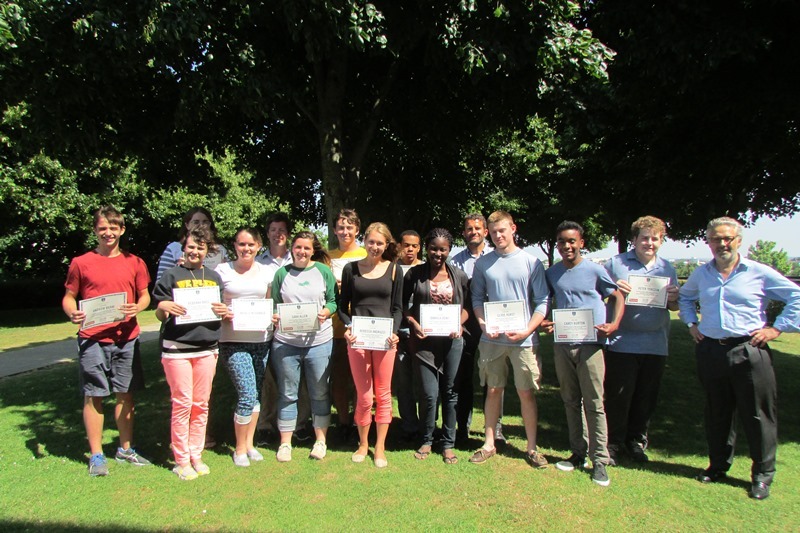 The students will return to the United States on June 30, 2015. For more information on the Normandy Academy, please call 504-528-1944, ext. 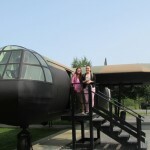 257 or email travel@nationalww2museum.org. This morning 25 high school and college students from all across the country will be traveling to France with The National WWII Museum as part of the Museum’s week-long Normandy Academy student travel program. 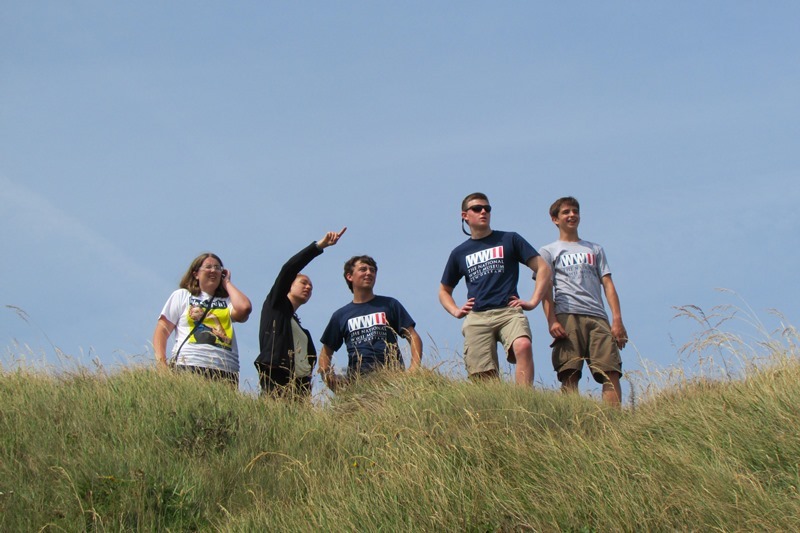 These students, guided by academic mentors and Museum professionals, will visit and explore the iconic D-Day battle sites such as Omaha Beach, Ste-Mere-Eglise and Pointe-Du-Hoc as they follow in the footsteps of the Greatest Generation. 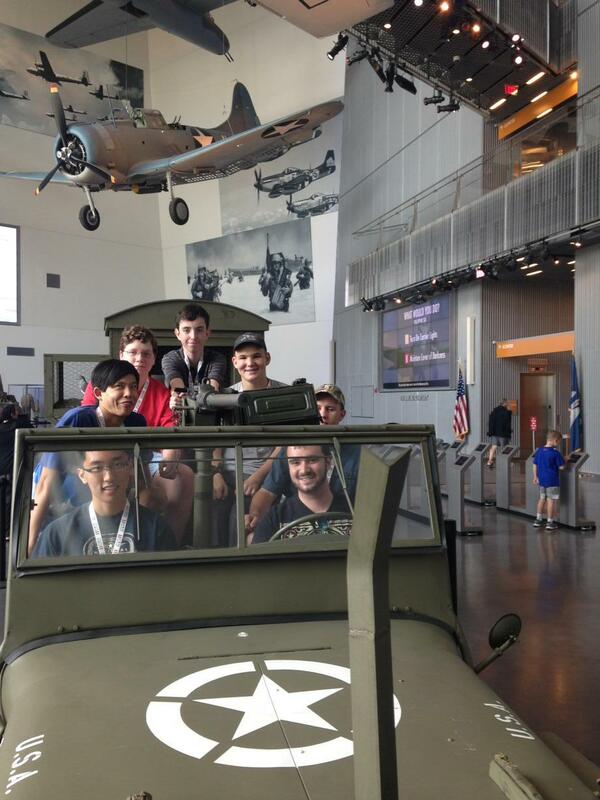 In preparation for their journey, students have completed readings, participated in strategic as well as moral and ethical debate scenarios and examined artifacts and primary sources documents on-site at The National WWII Museum. 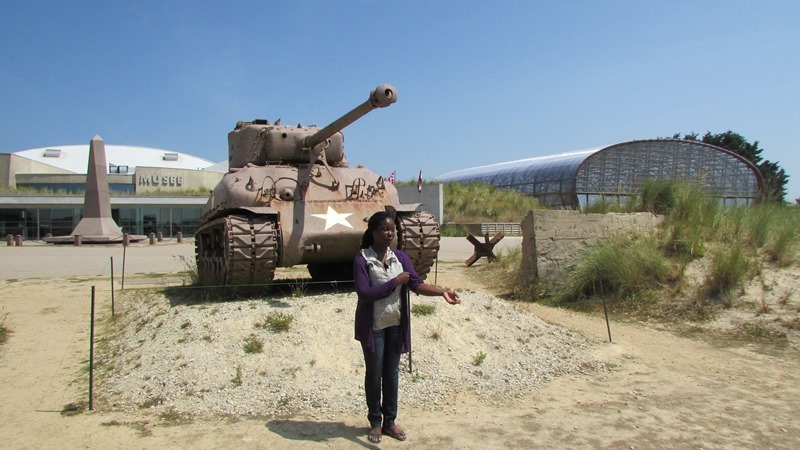 The National WWII Museum’s Normandy Academy is an overseas educational journey that challenges today’s students and tomorrow’s leaders to consider the same impactful choices made by WWII officers and soldiers during the historic D-Day invasions. Along the way, students will gain hands-on leadership and decision-making skills to prepare them for their futures. 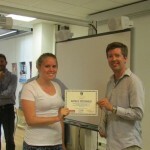 Learn more about the Normandy Academy student travel program. 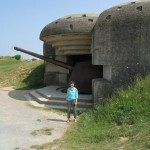 The students of the Normandy Academy spent three days honoring the efforts of the infantry, the airborne, and the Navy. The combined efforts of these three forces enabled the Allies to establish a beachhead, capture important objectives in Normandy, and ultimately break out on the Road to Berlin. 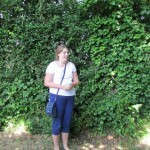 In the hedgerows, Susanna Sigler explained to the group that the fighting was done, “hedgerow by hedgerow and field by field.” Stéphane Lamache, the Director of the Airborne Museum in Ste Mere Eglise, added that often the weather was very damp, meaning that the paths had turned to mud, making mobility even more difficult. 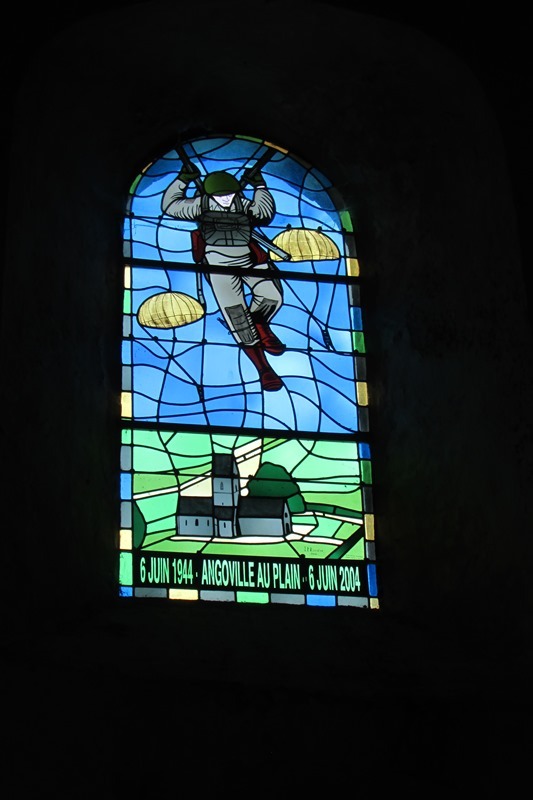 Stopping at the church in the village of Angoville Au Plain allowed the students to hear the story of two American medics from the 101st Airborne Division who treated anyone who entered the church without a weapon as battles raged around them. 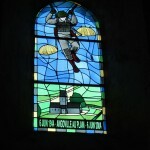 A stained glass window pays tribute to these two paratroopers. To explore the Navy’s contributions to D-Day, the students boarded the Etoile Magique, a research vessel currently mapping wreckage at the bottom of the English Channel. The students were able to discuss the use of sonar, remotely operated submarines, and divers to locate and map wrecks leftover from 1944. The trip to Normandy ends on Thursday, July 18 when the students visit the graves of their chosen soldiers and honor them with a eulogy. 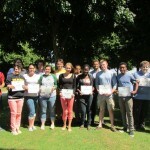 Normandy Academy in the French Press! 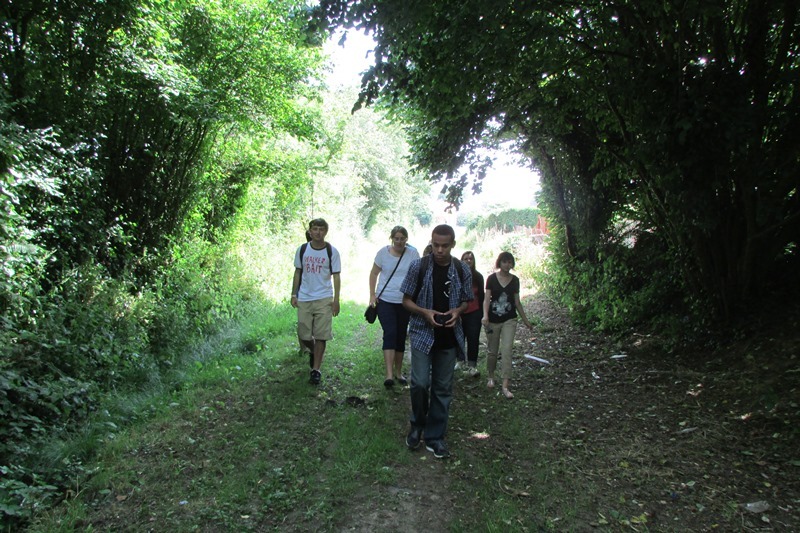 London Westley of Chicago leads the Normandy Academy through a hedgerow. 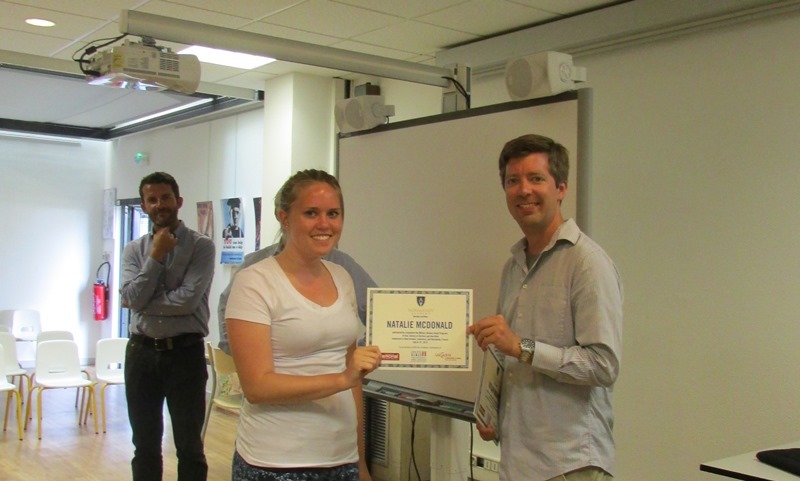 Natalie McDonald from Los Angeles receives her Certificate of Completion from The National WWII Museum, The Memorial de Caen and the Universite de Caen. 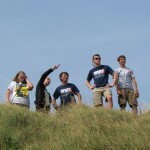 Rebecca Andruzzi explains the site advantages of holding the high ground at Omaha Beach. 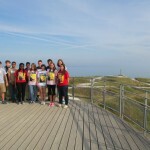 The Normandy Academy visits Pointe du Hoc. 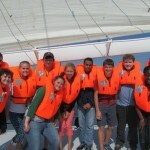 The Normandy Academy aboard the research vessel Etoile Magique in the English Channel. 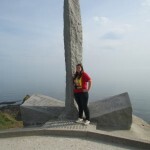 Sara Allen from Utah stands near the monument to the US Army Rangers at Pointe du Hoc. 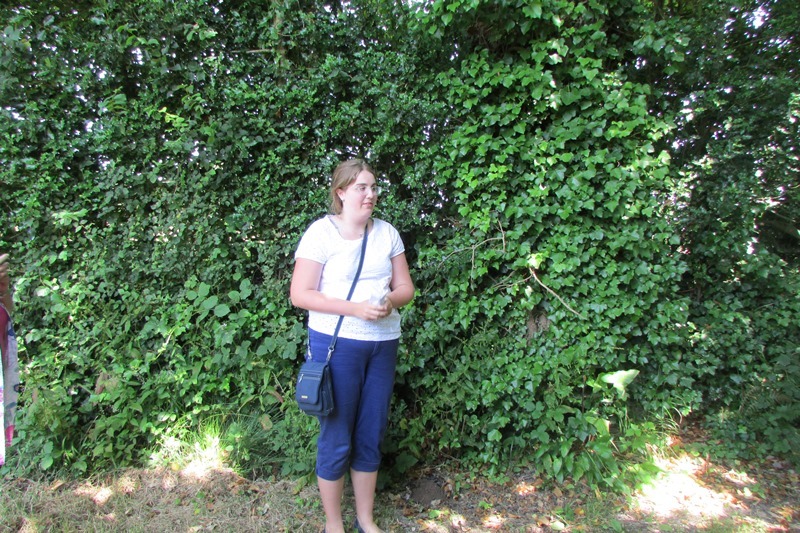 Susanna Sigler discusses the fighting that took place in the Bocage. 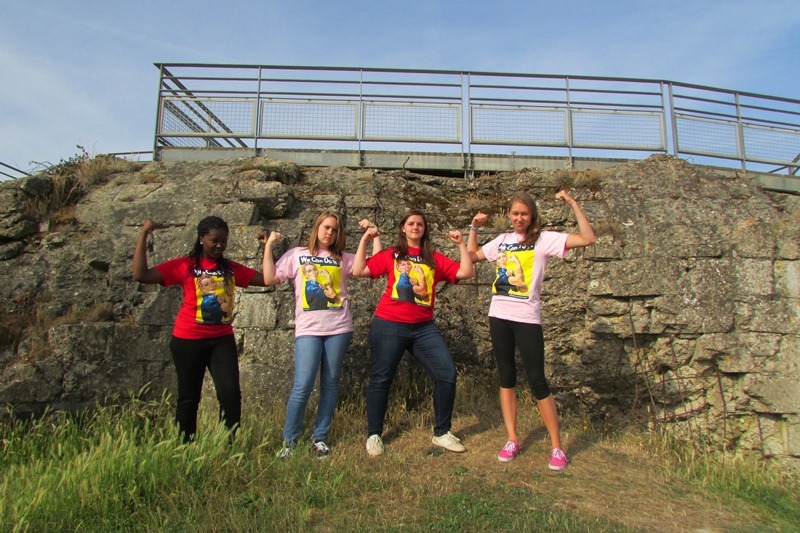 Daniela Deny, Natalie McDonald, Sara Allen, and Rebecca Andruzzi show their "We Can Do It" spirit at Pointe du Hoc. 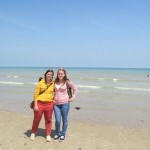 Dyland Monies and Rebekah Bass explore WN-62 at Omaha Beach. 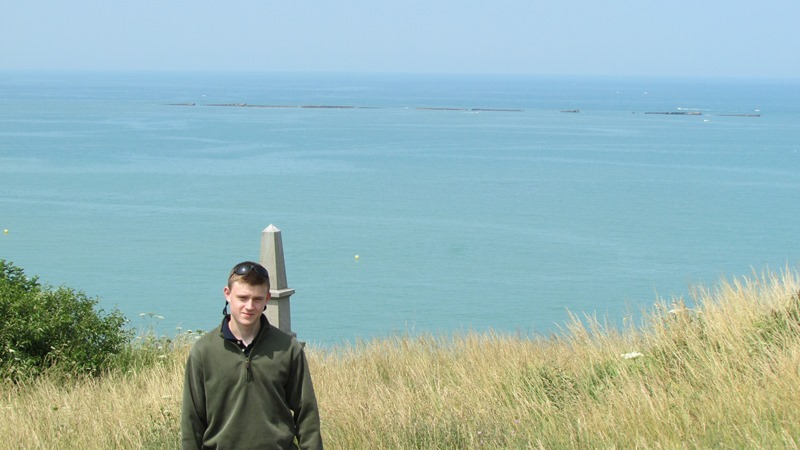 The 2013 Normandy Academy students have completed their third day touring in Normandy. 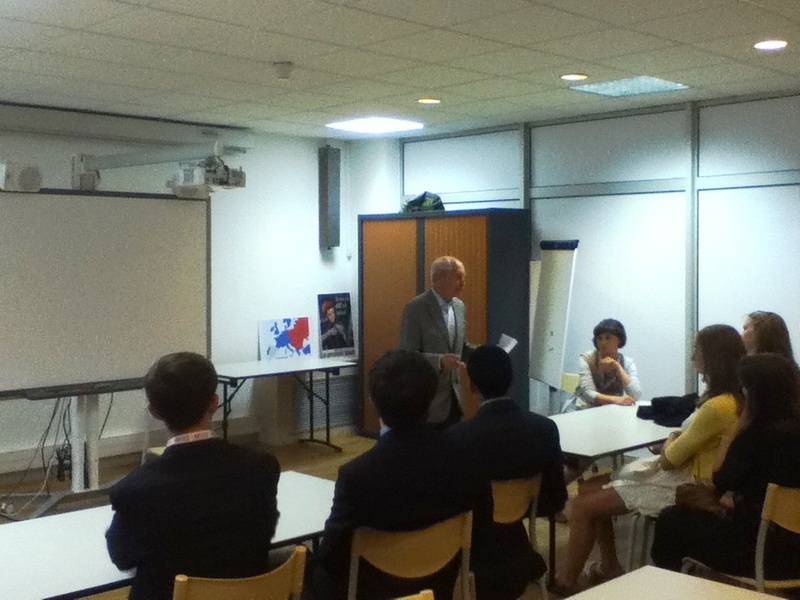 On the evening of July 11, the students met André Heintz, a 93-year-old native of Caen who was in the French Resistance from 1940-44. Mssr. Heintz told stories of listening to the BBC via a secret radio that he hid inside a spinach can and of secretly observing the German defenses in and around Caen to pass along. 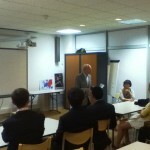 After his presentation, he joined the students for dinner and answered their questions for the rest of the evening. 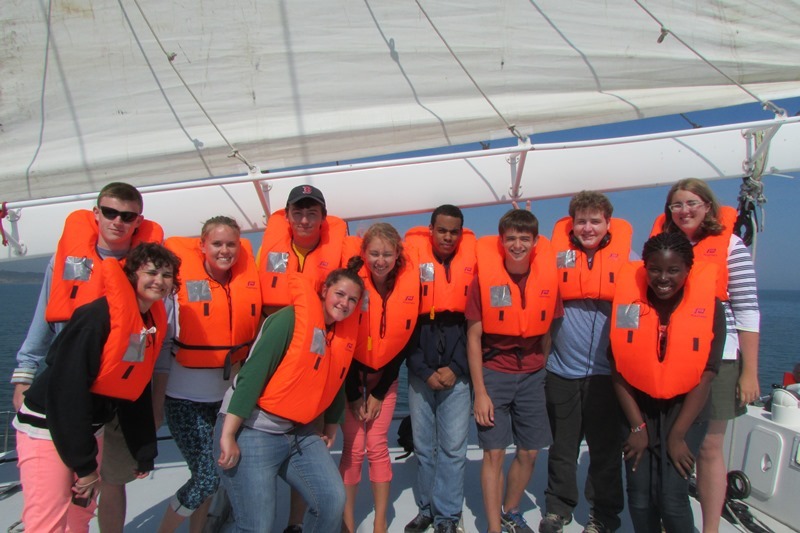 On Saturday, July 12, the students experienced a full day of touring in the British and Canadian sectors. 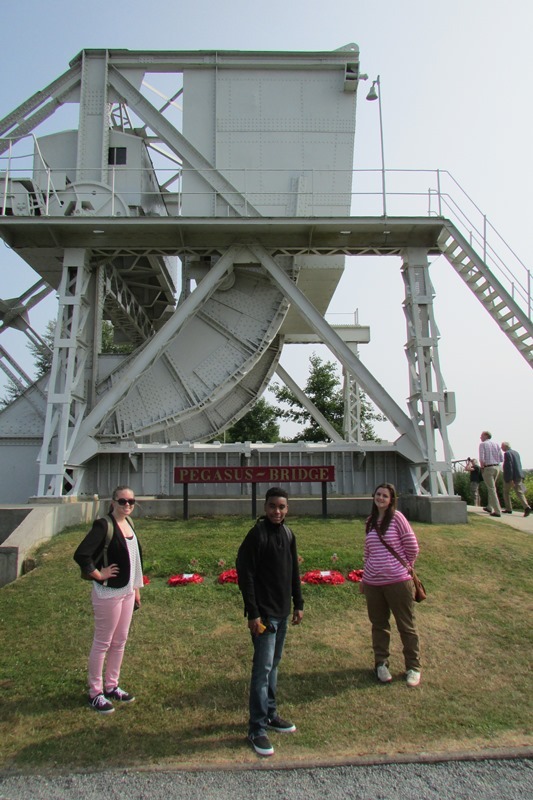 The first stop was at Pegasus Bridge, the site of the first Allied victory of D-Day. At 12:16 am, Major John Howard led three Horsa Gliders that landed just meters from the bridge. 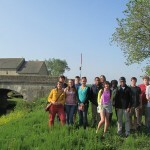 Minutes later, the bridge belonged to the British 6th Airborne Division. 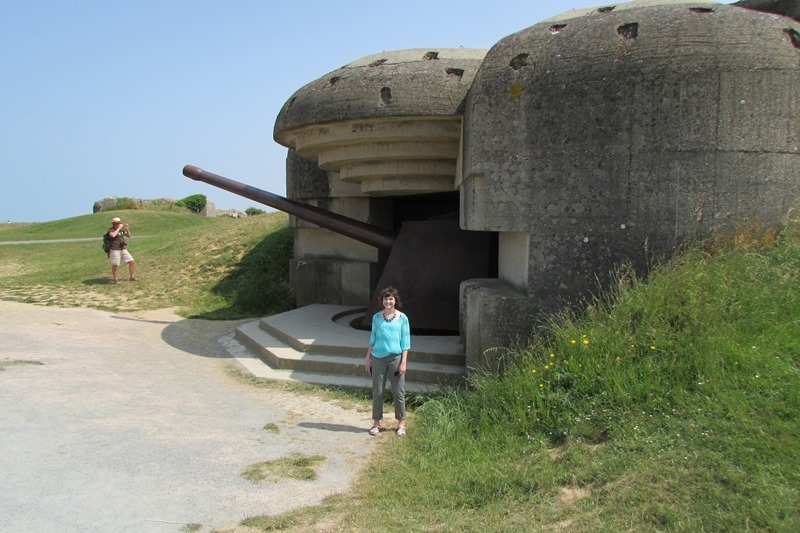 Other sites for the day included a German gun battery at Longues sur Mer, The Museum of the Atlantic Wall, and the remnants of Mulberry B in Arromanches. While at the bridge, Natalie McDonald of Los Angeles, CA, described the training that American soldiers underwent in England and the relations between American and British soldiers. She related that one American training manual said, “The British may not make a good cup of coffee, but you cannot make a good cup of tea.” Overall, she commented on how well the troops worked together to achieve objectives. 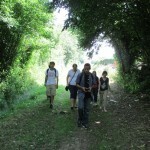 On Sunday, July 13, the day began with a visit to La Fiere Bridge. Before departing New Orleans, the students heard WWII veteran Tom Blakey, a member of the 505th Parachute Infantry Regiment, discuss his actions that led to the capture of the bridge over the Merderet River. Mr. Blakey told them the stories of firing on columns of individual soldiers and the years it took him to overcome the trauma of war. 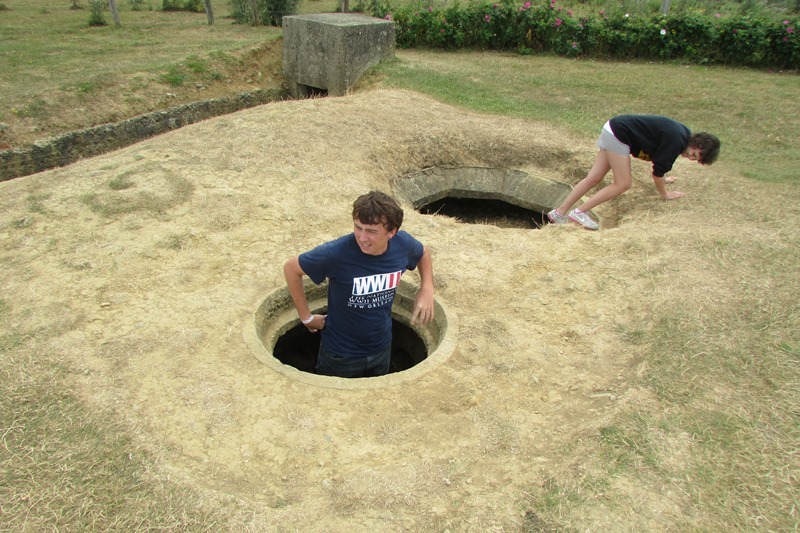 Standing in the places in which he fought was an emotional experience for all of the students. After departing La Fiere, the next stops were Ste Mere Eglise, Brecourt Manor, Utah Beach, and the German Cemetery at La Cambe. 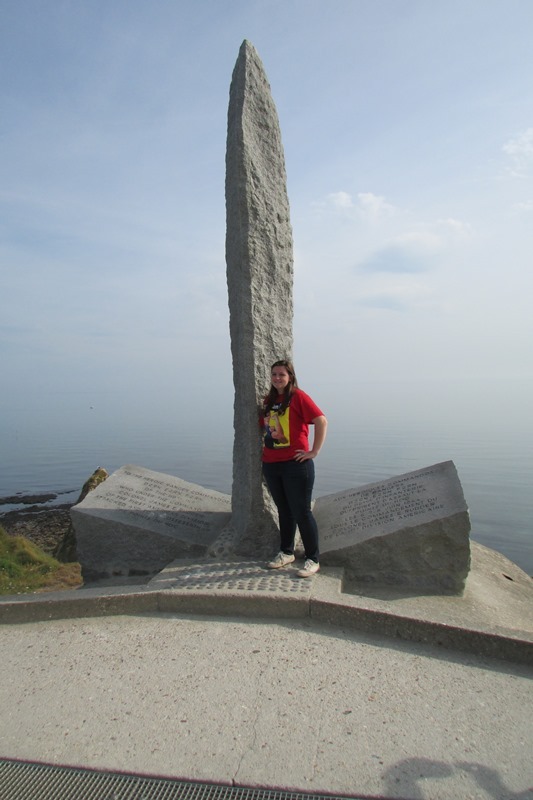 At each stop, a different student presented his or her own research on the landmark and its significance to the overall mission in Normandy. 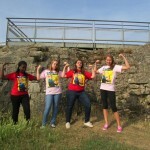 Normandy Academy makes the news in France! 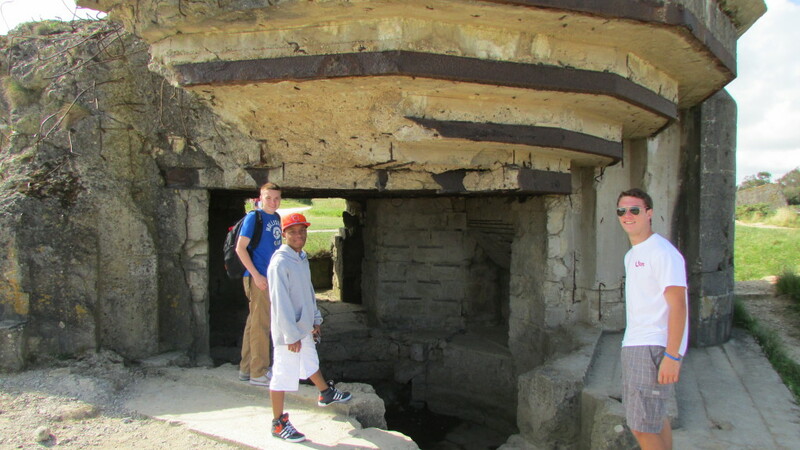 Upcoming stops include Pointe du Hoc, Omaha Beach, the Normandy American Cemetery, and a quick visit to the Bayeux Tapestry. 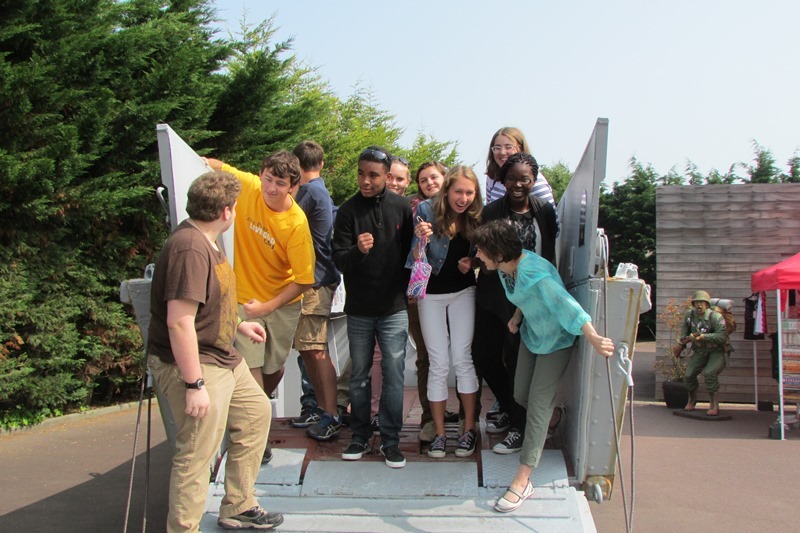 Peter Tengdin of Minnesota attempts to coax the Normandy Academy students out of their landing craft. 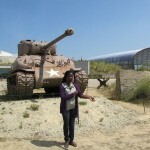 Clyde Hurst stands near the remnants of Mulberry B.
Daniela Deny discusses the role of Sherman Tanks in the Battle of Normandy.